DieHard Cricket Fans: It's World Cup Time! 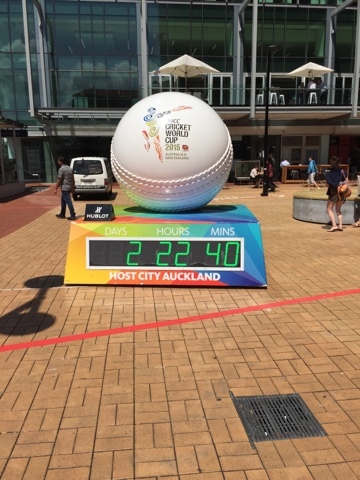 Just a matter of hours until the 2015 Cricket World Cup kicks off !! And this time I won't be battling petty annoyances like time differences. This is without doubt the pinnacle event of cricket, the one tournament that demands undivided attention among all cricket fans. I was 7 years old when the 1992 edition was hosted in Australia and New Zealand. Forget calling that a distant memory, it isn't a memory at all... and that makes this edition even more special with cricket's showcase event right here in our humble back yard. There is no test match championship, there is instead a dodgy ranking system which nobody really understands or pays attention to. So with the 'pure' form of the game not having a marquee tournament, this fifty over World Cup becomes the closest thing we have to gauge which cricketing nation is the best in the world. Does it truly reflect the greatest team? Australia rampaged through a triple strike from 1999 - 2007 when they were clearly the best in the business, so that made sense. But then again South Africa constantly under-achieve, New Zealand constantly over-achieve and Sri Lanka pulled off an underdogs dream in 1996 without dominating before or after. The answer then? Yes and no... two months of good cricket is enough to win the cup but is hard to pull off unless it is really deserved. So Who Will Win in 2015? It's a cliché, but his is truly one of the most open world cups in a long time. Ever since Australia climbed a few rungs down the latter it became largely an open playing field among the big guns. Unfortunately we have to write off UAE, Afghanistan and Scotland. I always welcome the little guys but again there are a few too many soft games coming our way. Of this group, Scotland is the most likely to pull a surprise. Bangladesh and Zimbabwe are capable of much more but can't seem to get it together. The West Indies won't show up among their political and selection battles, poor Jason Holder has to carry this hopeless mob on his young shoulders. Ireland will annoy one or two teams, may there be plenty of Irish luck. England are a poor ODI squad, they are all noise and hot air. Led by an Irishman who pretends they aren't scared of Mitchell Johnson, it's pretty hard to back the poms to go beyond the quarters. Sri Lanka rely too much on their ageing old boys club, there is surprisingly little else going on in their line-up. If Malinga turns up fit though then there could be surprises. Pakistan are the joker card of the pack, capable of anything and at the same time nothing. They are the gambling man's bet, although on paper though they are disappointingly inexperienced and average this time. New Zealand, who were dubbed by AB de Villiers as "World Cup favorites" not long ago... right before he and his men thumped us. A nice piece of reverse psychology! The fact is we finally have the talent for once, and that might actually go against us. We're famous for sneaking into semi-finals unnoticed but this time all the big boys will be watching closely. Australia and India are two teams never to be written off, both are cocky and annoying but they have genuine match winners littered in there and a genuine hunger to succeed. Always beware the wounded Aussie, however India will have to overcome their horrifically poor bowling and fielding. South Africa are the most complete team in the world, and yet you can never confidently say they won't pull out their token choke.